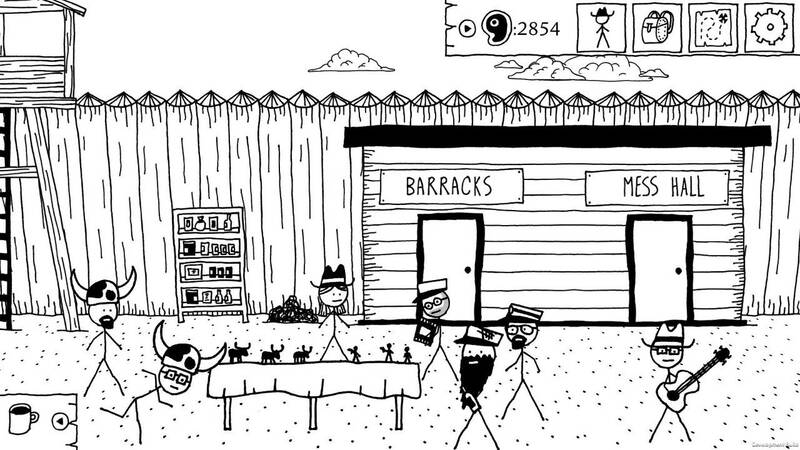 The wild, wild west is really, really weird. Combat is repetitive; too many items and skills to sort through; simple art style might turn some people away. 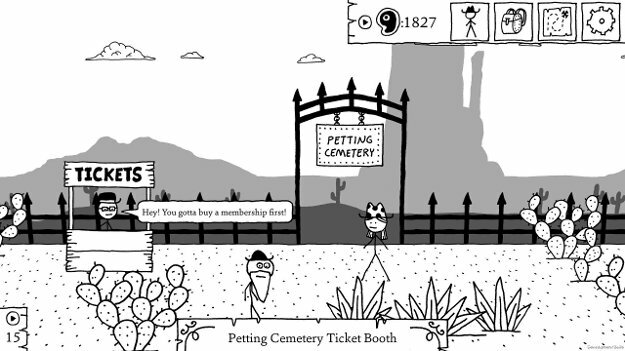 I really wasn't sure what to expect when I saw West of Loathing start up on my computer - I had played a small amount of the developer's previous foray, Kingdom of Loathing, many years ago, but other than that was walking into this endeavour fairly blind, knowing little except that the art style resembled something you might doodle on the side of your notebook while bored in class, or during a meeting. 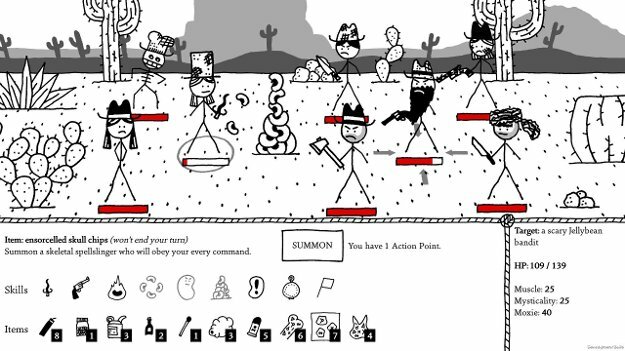 Mechanically speaking, what West of Loathing ended up being was a turn-based RPG with adventure mechanics, very similar in nature to an old PC game series from back in the day known as Quest for Glory. Mechanically speaking. What's hard to glean from pictures and first impressions, however, is the sheer amount of character that West of Loathing has stuffed into its package, with witty writing, jokes that stretch over the course of the game without overstaying their welcome, and a dearth of content that always seems to stay fresh. 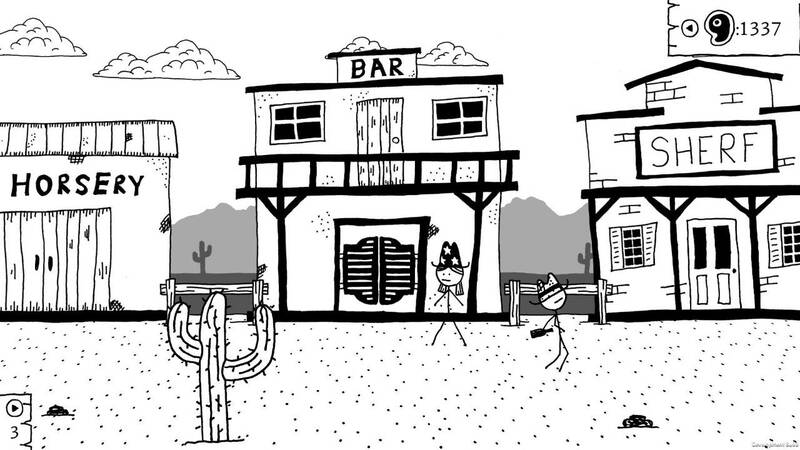 West of Loathing has you running around landscapes, similar to an adventure game, were that adventure game made of stick figures and crudely-drawn buildings. Like any other point-and-click adventure game, you can interact with objects, pick them up, talk to folks, and go from area to area. Different from most point-and-click adventure games, however, are the RPG mechanics that comprise the second layer of the game, allowing you to get into battles, use your stats and skills to open locks and 'dicker' with merchants, and use various items you find to raise stats, equip on your personnage, and fight enemies in turn-based battles. The mechanics themselves aren't terribly robust, and will probably look familiar to most. And the turn-based battles, to be frank, and fairly rote, with nothing much to differentiate them from other games of that ilk. To be frank, if this was just a adventure/RPG hybrid, it would be okay, maybe even above average. 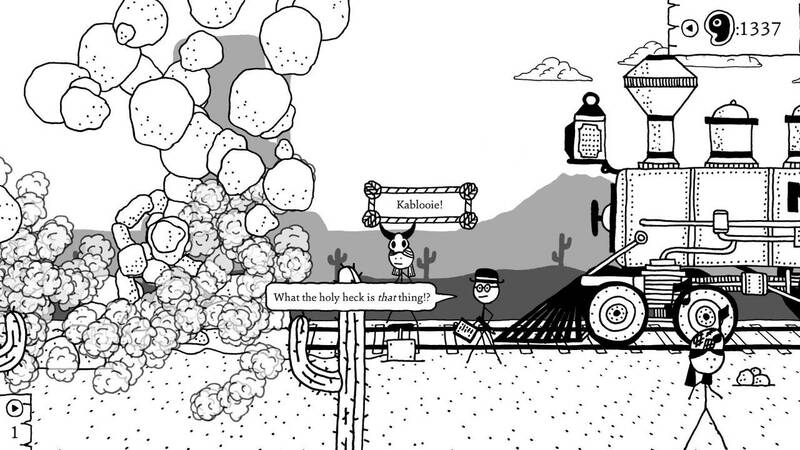 But West of Loathing goes much further than that, creating a bizarre, yet cohesive world, filled with humour, unique interactions, and just really a whole lot to do. I want to point to the book of Stupid Walking. This is a book that gives you a perk, and an option in the menu, called Stupid Walking. This option, which you can toggle at any time, makes you walk like an idiot. Anytime your character walks, he'll do it in a stupid way, like sliding on the ground, taking huge steps, rolling, or any other of the numerous ways you can walk stupidly. Mechanically, it does absolutely nothing. There's no bonus to it, there's no additional scenes unlocked because of it, you just...walk stupidly. It's a joke without being a joke, and the game is full of them. I think it was about the time when I had a choice between a dark horse, crazy horse, pale horse (possibly a ghost), and a totally regular horse, definitely nothing wrong with it, four legs and all, that the game really endeared itself to me. Every spitoon in the game lets you rummage around in it for treasure, despite warnings and pleadings from the 'narrator' to do otherwise, eliciting paragraphs of disturbing text about what it looks, feels, and smells like. Hell, the three classes in the game are called "Cow Puncher", "Bean Slinger", and "Snake Oiler". And even the world feels cohesive despite all this, a world where meat is mined from the ground and used as currency, where rodeo clowns are feared, and where something known as "The Day the Cows Came Home" is a near-apocalyptic disaster. There is humour crammed into every nook and cranny of the game, and it just makes it so much fun to find more of it out. 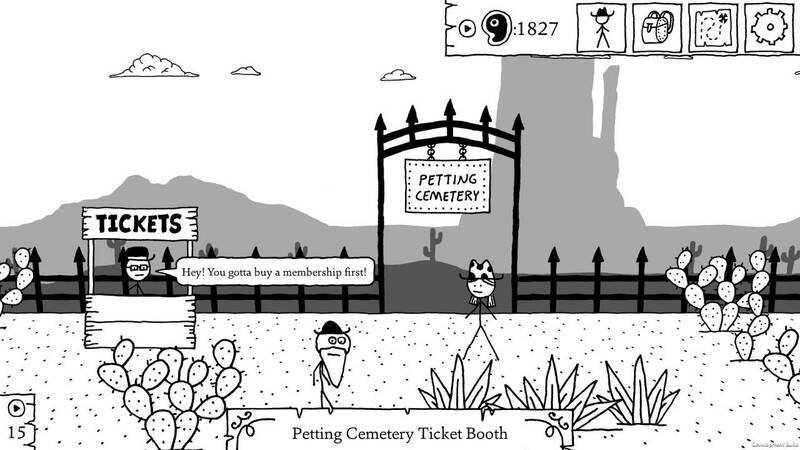 Which is good, because there is a lot to find in West of Loathing. A bevy of sites to explore, of characters to meet, sidequests and side-content to find and complete. It's unlikely you'll even find it all in your first playthrough - I'm certainly gearing towards multiple playthroughs to see what it's like to play as other classes. Again, there are issues with the turn-based combat - it's slow-paced, a little dull, and the game throws so many usable items and skills at you that it's very unlikely you'll find a use for most of them (I mostly just powered myself up, weakened the enemies, then went to town with punchin'). It's really the game's greatest failing. 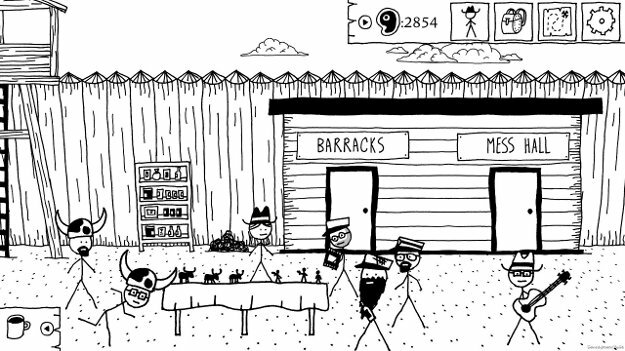 But it stands as a testament to the rest of West of Loathing that, despite this, it's a really fun game to play. It's got a style of humour that so many other games lack, there's lots of hidden gems to discover, and has really defined itself as one of the most creative RPGs in recent memory.